Travellers Tales and Warner Bros. Interactive have release a brand new trailer Lego: The Lord of the Rings. Much like other previous Lego titles, the game is set to feature multi-player drop-in/drop-out co-op gameplay as you travel throughout the cute lego-version universe of everybody’s favourite fantasy franchise. Based off the Peter Jackson adaptation of the books, the game is set to feature voice acting from the films and will be focused on the entire adventure as a whole, covering all three films. I dunno about you guys but I can’t wait to play as LEGO-las. Sorry, had to say it. Rumour has it that Lego: The Lord of the Rings will have a 26th October release date, just in time for release of the upcoming LOTR film The Hobbit: An Unexpected Journey. 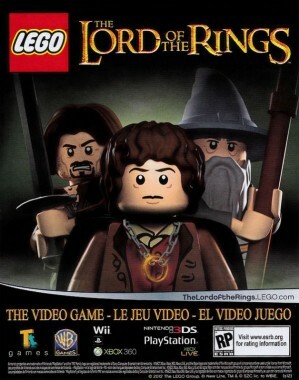 Regardless, we do know this: it’s coming to Xbox 360, PLayStation 3 Wii, 3DS and Gandalf looks awesome as a lego character. For more, check out the trailer below.